UK Archaeologist and historian Neil Oliver arrives with his team to film the vast and spectacular coastline of Australia. It is the largest expedition the Coast team has undertaken. 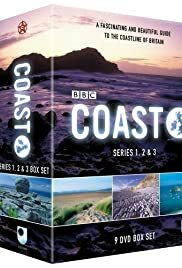 Having lived by the Northern Irish coast all my life until this year,and Glasgow is still arguably on the coast, this documentary beautifully put together all the reasons why Britain and Ireland are unique as island nations. The beautiful shots of scenery combined with various interesting experiments and journeys into history provided something for everyone. I particularly appreciated the scientific gems which have, unknown to me, sprung up on our coast, as well as the frequent reminders of how modern life is putting the splendours of our coast under threat. The team of experts were a treat in themselves and I found myself watching them as much as what they were presenting. Nick Crane's adventure and pure joy is infectious and I found myself waiting for the next scene of the dark, brooding Neil Oliver telling a grisly tale of British history with his black locks blowing in the wind. It was great to see him taking over the lead in series 2 & 3 and I think he is one the finest Television presenters around. Truly fascinating exploration of the geology and marine life around our shores thanks to Miranda Krestofnikov and Alice Roberts. And no reconstruction is too big for the adventurous archaeologist, Mark Horton. A testimony to the feat of this series came while I was travelling in the Highlands. Having recently been to Eilean Donan Castle in Dornie near Skye, I was embarrassingly excited to meet one of the men interviewed on Coast and asked him all about his experience. His 5 minute interview on the DVD came out of an amazing 4 hours of filming, testifying to just how much excellent material was collected for the programme.